Polka Dot Overload | Sewing, knitting & vintage projects, tips, tutorials and cartoons! : How Do You Self-Rate? + Real-Life Sewing Encounters! How Do You Self-Rate? + Real-Life Sewing Encounters! In between the usual sewing-nerd-type chatter about patterns and color and seam finishes and fabric stash overload we got onto the anxiety-provoking topic (for me, at least!) of self-rating oneself as a sewist. How do you know when you're not a beginning sewer anymore? What is the magic combination of experience and skill set that rates a self-promotion to the land of intermediacy? 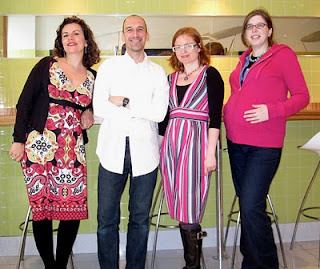 Now five of us are PatternReview members and some of us are on BurdaStyle as well. Both social sewing networking sites ask you to rate yourself by skill level, and these ratings appear on your profile, next to forum posts, and alongside your pattern reviews. BurdaStyle makes things comparatively painless -- the only options are "novice," "intermediate" and "expert." But my beloved PatternReview has a five-tier system (depicted in the above illustration.) There's no clear criteria given--it's up to the seamstress/seamster, though there have been discussions over the years on the PR Message Boards. Of the five of us who met up on Friday, all self-classify as "Advanced Beginner" on PR, with the proud exception of the Slapdash Sewist (who ranks herself as "Intermediate", since no one would believe someone who has reviewed and made over 160 patterns, many of them super-crazy-complex, to be a "beginner" anything). This despite the fact that Elizabeth makes boys' shirts with perfectly pointy collars and lovely lined & pleated wool skirts, or that Peter can match plaids, make jeans, jumpsuits and fancy dresses and spin soiled sheets into club collar gold. 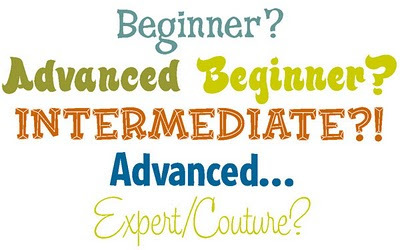 Yet both Peter and I classify ourselves as "Intermediate" on BurdaStyle... since we're obviously not just "Beginners." 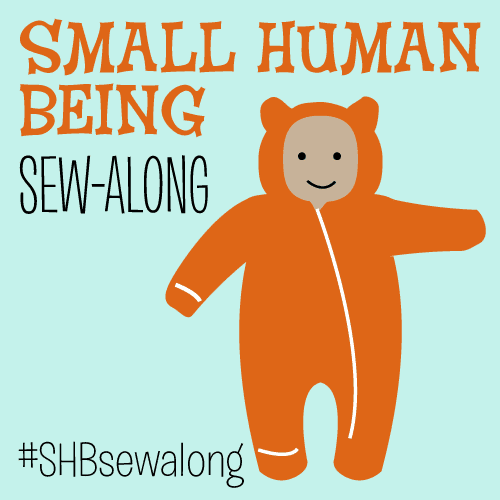 Perhaps I'm making too much of a small thing--what does it matter exactly how you grade yourself, as long as you're having fun sewing (which I SO am)? Still, I'm a goal-oriented gal, and in my head I imagine all the fun sewing mountains I might climb to inspire a self-promotion "Advanced Beginner" to "Intermediate"--constructing a fitted underwire bra? a somewhat-tailored jacket? a men's button-down shirt? Duration: I've been sewing since I was five, at least a few years of that with some seriousness and dedication. Garment types: I've made fitted woven dresses and skirts (some lined, even!) that actually look good on me. In the knit garment department, I'm pretty handy with tops, baby clothes, sweatshirts, skirts, lingerie (including supportive, if not underwire bras), and dresses. Machine prowess: I've used a variety of sewing machines, am very comfortable with my beloved Viking Platinum 730, and recently have gotten quite cozy with my Kenmore serger. Patterns: More and more I take pattern instructions with a grain of salt and substitute other construction orders/methods/techniques. I've made traced patterns from magazines and (mostly) remembered to add in seam allowances. Fitting/alterations: I know my way around several types of major FBA and pregnant tummy adjustments and am not afraid to move and add darts, gathers and other fullness control methods as needed. Drafting : I've been trying out some very basic drafting (full skirts, changed necklines) and having a blast. Fastenings: I can insert zippers (invisible and not) and hammer on snaps. Fabric: I have a pretty good handle on how to cut, care for, and use a variety of fabric types and weights in knits, wovens, cottons, and wools. I cut on-grain and I carefully match my patterns to fabric and prints. I'm getting there on understanding interfacing types and sewing with stripes and plaids, too. Also: I THINK and READ and TALK and WRITE about sewing. A lot. Probably way too much. ...made a successful pair of pants. We will not discuss the elastic-waist gingham disaster of 1999. ... applied patch or welt pockets. ... come even vaguely close to tailoring anything, or even making an unlined jacket. ... made a blouse or shirt with a real proper collar and cuffs (in fact, I've only made one collar in my life). ... achieved a perfectly-eased sleeve cap. ... made a single buttonhole, bound or otherwise. ... managed to sew with slippery silk without repeated cursing/weeping. Among other things. So an Advanced Beginner I shall stay--for now. How about you--how do you rate yourself? Is this something you even think about at all? Are we sewists prone to real (or false) modesty, or just anxious that we'll be secretly scoffed at if we "over"-rate ourselves? I was thinking about this a month or so ago, when I realized I was still thinking of myself as a beginner even though I'd spent four years sewing rather intensely. Made multiple pairs of jeans, lined jackets, blouses, skirts, dresses. Sewed with knits and wovens, drafted basic patterns. In my case it's definitely an instance of being worried I'll be scoffed at if I overrate myself. In my head, there's are imaginary expert seamstress police who will come out of the woodwork if I dare to think I'm better than I am. I love this post as I had a major meltdown today and wanted to curl in a ball and cry that I can't sew. When in fact, I've been sewing for over 25 years and have done/can do your list plus the list you haven't done with the exception of the silky fabrics (that's on my list for this year). I've read and watched what you're sewing and I would call you at the very least an Intermediate sewer or at the beginning stages of Advanced. I just think there are always things we aren't going to enjoy doing or we aren't going to do very well. For me, it's the freaking piping on the pockets of my Ramonster-knock-off Liberpool dress I'm working on right now. Can someone just come to my house and make the piping go in perfectly straight with crisp corners? Thanks. I like to think of myself as intermediate/advanced. There is much I can do - and much I do to make my garments more couture than store-bought or factory-made. I really enjoy your blog - but you look nothing like you avatar you made! You are much taller! Either that, or I am still way short (5'4"). Heather, you remind me of all the things I forgot to include! Piping is so on my learn-to-do-ASAP list. Lady Jenn, I'm not even quite 5'6". My digital croquis probably looks a bit shortish because of the angle of the photo I based it on... but in the case of this photo I think I just happen to be in a relatively short group, plus I'm wearing thick-soled winter boots. Hi Mikhaela...great post. I definitely classify myself as a beginner since I only finished my first sewing project less than 6 months ago....but I always wonder what the different skills are to progress to Beginner Intermediate? Or beginner advanced? I just finished my first pair of trousers (love them), I mainly sew from vintage patterns (sometimes unprinted patterns), and mostly from the 30's-50's meaning a lot more tailored pieces. I think once I sew more items then maybe I will be more of a beginner intermediate. I'm happy being a beginner now because everything feels new and exciting! I love learning new things...so it's great. The only thing is that I wish I could sew faster but I think that comes with time and experience! I'm definitely a beginner (first encounter with a sewing machine 3 months ago) but that hasn't stopped me buying an intermediate pattern and being determined to make it up this weekend! So far technique doesn't seem to be a problem, but interpreting pattern instructions is a stumbling block. I'm currently making a 1950s blouse - on one of my rare free evenings after work when I thought I could finish it, I spent the whole night reading out one line of instructions with different intonations (is it a noun? is it a verb?) to try to work out what it meant! I don't really think about the "box" I fit in at all. I do envy other sewers who have skills I don't have (yet)! If I were to rate myself I'd say intermediate for these reasons: 1. I sew and finish (however well...) BWOF patterns with three out of fout dots; 2. I'd instinctively say you're a beginner when learning the basics (straight seams, curved seams, pattern reading, maybe a fastening or two). You're an intermediate when you know the basics and learn advanced techniques (welt pockets, advanced pattern sewing). You're advanced when you've done most techniques, and done them reasonably well. If you were only advanced if you could make your own patterns and sew couture-level ballgowns there would hardly be any advanced sewers, right? After all, these categories are for people doing it as a hobby. Debi, I think that's one of the main reasons I am afraid to promote myself--I am pretty fearless when it comes to tackling all kinds of projects and new techniques, but until I have done something multiple times and get really comfortable with it, I am SO incredibly slow! This was really cool; however, it made me think. What if you are someone (me) who accomplished things like bound buttonholes, Vogue Advanced patterns, and the like over 10 years ago and now only do simpler projects? Can you still call yourself Intermediate or (gasp!) advanced? Susan, you are a perfect example--you've reviewed 68 patterns on PR and always look amazing in your lovely fitted creations, yet you self-rate as Advanced Beginner. And apparently you are also a contortionist! Good post! My skills are really uneven so I decided to leave myself as an Advance Beginner, too. I've tried a lot of different skills - zippers, button holes, lining, facing, curves seams, sleeves, pockets (not welt, though), etc, etc, etc... But am I proficient? Definitely not! I guess I will give myself an upgrade once I feel like I really have mastered these techniques. Mmmm, bound button holes are delicious. Id call myself barely intermediate, but not by much. Im completely self taught and sometimes feel like a poser, especially when I taught sewing classes. Im really into construction of a garment, not so much making it 'my design'. When I go buy readymade (which I haven't done in about a year) I am constantly looking at seams and construction and driving my shopping friends crazy with my snoodie, "I can make that" tone. I think I will always consider myself a student of this medium. I think if you love it, you always will. I dont think I considered myself past a beginner until someone whose skills I greatly admired admired mine! THAT was an awesome feeling.